Linfield manager David Healy (left) collects his award from NIFWA chairman Keith Bailie. Linfield boss David Healy is keen to continue his side’s award-winning August momentum into the start of September with a weekend home test against Ards. Healy this week was confirmed as the Northern Ireland Football Writers’ Association’s ‘Manager of the Month’ winner for August. An unbeaten start to the Danske Bank Premiership programme resulted in league wins over Glenavon, Institute and Crusaders, plus a 1-1 draw against Cliftonville. August’s run also included success by 8-0 over Moyola Park in the BetMcLean League Cup. 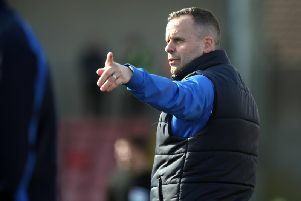 “A lot of people doubted Linfield this season, so we were determined to make a strong start to the season and, thankfully, we have managed to do that,” said Healy. “September will be another difficult month, starting with Ards on Saturday. “We had a difficult run of fixtures in August, so I’m delighted that we have finished the month unbeaten. Ards boss Colin Nixon is aiming for a positive approach to the Windsor Park trip. “Each week, you have to do your homework on the opposition and set-up accordingly, if you don’t do that, you’ll be embarrassed,” said Nixon. “Linfield will be tough for us as they have made a great start to the season, also, we have a few injuries now which is tough on us with a small squad. “But we will go there with a positive attitude, we will prepare and give it our best shot.